The Rab Vapour-rise Stretch Top falls in to the lightweight pile-pertex category, making a functional and versatile standalone piece throughout the summer months and in conjunction with other clothing as part of a layering system in the winter months. The idea of soft-shell and pile-pertex clothing is so that the one item of clothing will work in roughly 90% of weather; this is something the Rab Vapour-rise Stretch Top does very well. In warm weather with the sleeves pulled up (a tight fit over the forearms) and unzipped down the front you can remain relatively comfortable. In contrast for the winter months with the thumb loops pulled over and the neck cinch cord pulled in around your neck you can use it in moderately cold weather. As a standalone piece it is great for summer rock climbing (although you will need a belay jacket to stop the wind from howling through the powerstretch at times), and when in the mountains and in winter combining it with a shell jacket or just another soft-shell jacket works well. In winter you can walk comfortably in the top (without overheating) and then when you stop or as the temperature drops use the thumb loops in conjunction with gloves and over layer your top half with a shell jacket etc. The Rab Vapour-rise Stretch Top fits quite snugly as its unlikely you would wear anything underneath it other than a baselayer, instead opting to layer over it. Rab have cut the fabric high in to the armpits and in conjunction with the powerstretch that runs up through the shoulders, it allows almost unhindered arm lift. This is one of only a few jackets currently on the market where you can reach high above your head without it lifting at the hem. I’m a great believer in design simplicity and the singular chest pocket is sufficient for all of my needs. Whilst it won’t fit an OS map in to it (why would you want to?) it is big enough to stash most gloves etc. As mentioned above the thumb loops give extra protection without gloves and the sleeves to be tucked in with gloves (just make sure your gloves are big enough). 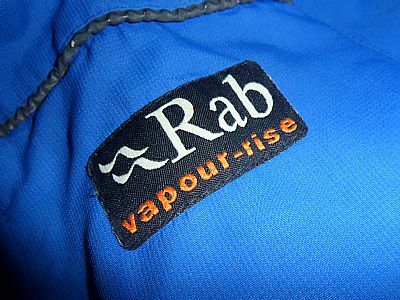 A warning for the beardy or stubbly – in the time I’ve been using Rab Vapour-rise Stretch Top I have managed to wear through the fleece chin guard at the top of the zip. Elsewhere the pertex equilibrium fabric has proven to be extremely durable – beyond all expectations given the amount of use it has had. However there have been some reports of pertex equilibrium bobbling from wear with rucksacks etc. This is not something I’ve experienced with this jacket but another jacket I have made from pertex equilibrium. The powerstretch panels have survived reasonably well with the exception of the cuffs where rubbing whilst rock climbing has meant they are now quite worn. A final word on the pertex equilibrium fabric, after relatively small amounts of precipitation the fabric will quite easily wet out and whilst reproofing does help this, its water resistance is not akin to that of other pertex fabrics in reality (e.g. pertex 6). It does shed light snow and some light rain, but anything more and you will be reaching for your shell jacket (This is partially inevitable due to the lack of a hood). The thumb loops (again) and the ability to pull the sleeves up (with some difficulty) allow you to regulate your temperature more easily (wrists covered up in the cold and then sleeves pulled up in the hot). The neck cinch cord – similarly to the thumb loops this allows you to cinch it in around your neck when it’s cold helping to conserve that all important heat. The fabric combination does wick well, dry quickly and make you feel more comfortable throughout the course of a day than most “soft shell” fabrics will. The powerstretch panels do allow wind through quite easily, which is great whilst hot and active but remember you will need to use a windproof insulating layer or belay jacket when stationary in cold weather. The pertex equilibrium is not the most water resistant fabric out there (see above in main review); however its wicking, breathability and general comfort levels make up for a lack of water resistance. The powerstretch cuffs can be irritating when damp as they tend to cool your wrists down, but they are arguably a better alternative to a more bulky Velcro closure. Lack of a hood? Some people may want a hood, but for this particular jacket, I think it extends its versatility by not having one – allowing you to overlayer in the winter months with an additional soft shell and/or shell jacket without ending up with 4 or more hoods to deal with (including your belay jacket hood). The name vapour-rise stretch top could almost be used as a synonym for versatility due to the amount of weather conditions it excels in, from hot summer rock climbing to being layered beneath another soft shell jacket, a shell jacket and a belay jacket in the depths of winter. Admittedly it won’t keep you warm on a cold wet windy day by itself but it does seem to fit itself in to an overall system that will keep you comfortable extremely well.